On iOS devices, a user interacts directly with the touchscreen. On Apple TV, a remote is used to control the interface indirectly. The user navigates to a specific item onscreen and then presses a button on the remote to select the item. The item on the screen becomes focused as the user navigates through the items on the screen. Focus refers to the effect onscreen of external, indirect user input from a remote or another input device. In a focus-based interaction model, a single view onscreen is considered focused, and the user can move focus to other views by navigating through different UI items onscreen, which triggers a focus update. The focused view is used as the target of any user actions. For example, if an onscreen button is focused, the button’s action is triggered when a select event is sent from a remote. The UIKit framework only supports focus-based interfaces, and in most cases this behavior is automatically provided where it makes sense to do so. You can ask for focus updates programmatically but cannot set focus or move focus in a certain direction. For example, UIButton objects are focusable, but UILabel objects are not. For apps with custom user interface components, you need to implement custom focus behavior, as explained in the Supporting Focus Within Your App section. The UIKit items such as UIButton, UITextField, UITableView, UICollectionView, UITextView, UISegmentedControl, and UISearchBar are focused by default. The system within UIKit that controls focus and focus movement is called the focus engine. A user can control focus through remotes (of varying types), game controllers, the simulator, and so forth. The focus engine listens for incoming focus-movement events in your app from all these different input devices. When an event comes in, it automatically determines where focus should update and notifies your app. This system helps to create a consistent user experience across apps, provides automatic support for all current and future input methods in every app, and helps developers concentrate on implementing their app’s unique behavior rather than defining or reinventing basic navigation. Only the focus engine can explicitly update focus, meaning there is no API for directly setting the focused view or moving focus in a certain direction. The focus engine only updates focus if the user sends a movement event, if the system requests an update, or if the application requests an update. To learn more about how and when to manually update focus, see Updating Focus Programmatically. The focus engine controls focus to make sure that it does not move around the screen unexpectedly, and that it behaves similarly across different applications. This control helps prevent confusion for the user, and means that developers do not have to implement their own custom solution for managing focus appropriately. The focus engine communicates with your app using the UIFocusEnvironment protocol, which defines the focus behavior for part of the view hierarchy. UIKit classes that conform to this protocol include UIView, UIViewController, UIWindow, and UIPresentationController – in other words, classes that are either directly or indirectly in control of views on the screen. Overriding UIFocusEnvironment methods in your views and view controllers lets you control the focus behavior in your app. The focus engine automatically determines where focus should move in response to navigation events from a remote or other input device. Users can move focus in any two-dimensional direction: left, right, up, down, or diagonal (if supported by the hardware). For example, if the user swipes to the left, the focus engine tries to find a focusable view directly to the left of the currently focused view. If a new view is found, then focus moves to that view; otherwise, focus stays on the currently focused view. The focus engine also automatically handles sophisticated behaviors, if they are supported by the input device. Examples include momentum-based movement after a fast remote swipe, modulating focus-related animation speeds based on focus velocity, playing navigation sounds, and updating scroll view offsets when focus moves offscreen. To learn more about focus-related animation, see UIFocusAnimationCoordinator Class Reference. When deciding where to move focus in response to a user action, the focus engine takes an internal picture of your app’s user interface and highlights all the visible regions of all focusable views. This means that if a focusable view is completely underneath another view, it will be ignored, and for any views that are partially hidden it will only consider the visible regions. Using this technique, the focus engine starts from the currently focused view, and finds any focusable regions that are directly in the path of motion. The size of the search area is directly related to the size of the currently focused view. If the focus engine finds a new view to move focus to, it gives your app a chance to validate the move before the move occurs. The operating system calls the shouldUpdateFocusInContext: method on every focus environment that contains the previously and next focused views. The previously focused views are notified first, then the focused views are notified, and finally the parents of those views are notified. If any focus environment returns NOfalse from shouldUpdateFocusInContext:, then the move is canceled. To learn more about focus environments, see UIFocusEnvironment Protocol Reference. When an app launches, by default the focus engine determines a starting focused view for you. This view is usually the closest focusable view to the top-left corner of the screen. However, your application can provide hints for where focus should go by default, using the UIFocusEnvironment protocol’s preferred focus view. When setting initial focus, the focus engine first asks the window for its preferred focus view, which returns its root view controller’s preferredFocusedView object. Because the return value is a UIView object, which conforms to UIFocusEnvironment, the focus engine then asks the UIView object for its preferred focus view, and so on. 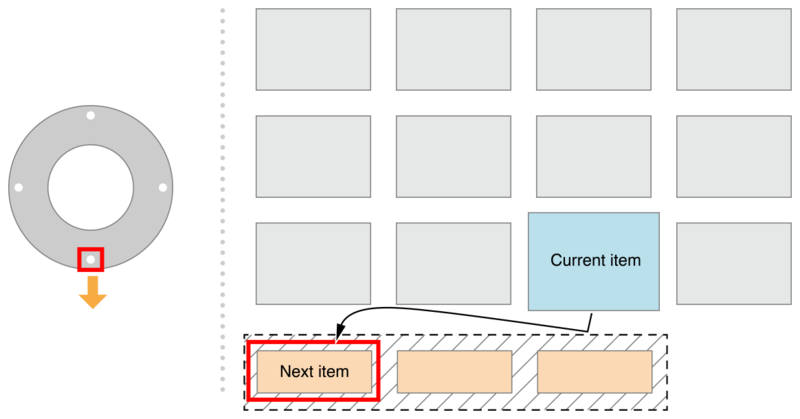 This linked list of returned preferred focus views is the preferred focus chain. The focus engine follows this preferred focus chain until it reaches a view that returns self or nil. From the list, the view farthest from the initial window (or deepest) is chosen as the focusable view. The focus engine asks the root window for its preferredFocusedView, which returns its root view controller’s preferredFocusedView object. The root view controller, a tab view controller, returns its select view controller’s preferredFocusedView object. The select view controller overrides its preferredFocusedView method to return a specific UIButton instance. The UIButton instance returns self (the default), and is focusable, so it is chosen by the focus engine as the next focused view. Whenever focus updates to a specific view, the new focused view is set to that view’s deepest preferred focusable view, as defined by the preferred focus chain. Another example of a focus chain: When a view controller is modally presented on top of the currently focused view, focus is updated to the new view controller using its preferred focus chain. A focus update occurs when the user causes a focus movement (for example, by swiping on a remote), the app requests an update programmatically, or the system triggers an automatic update. The focusedView property is updated to reflect the newly focused view or its preferred focused view. The focus engine notifies every focus environment that contains either the previously focused view or the next focused view (the view that is focused after the update) by calling didUpdateFocusInContext:withAnimationCoordinator:. Use the provided animation coordinator to schedule focus-related animations in response to the update. See UIFocusAnimationCoordinator. After all the relevant focus environments have been notified, any coordinated animations are run together at the same time. If the next (updated) focused view is in a scroll view and is offscreen, the scroll view scrolls the content so that the next focused view moves onscreen. A focused view is removed from the view hierarchy. 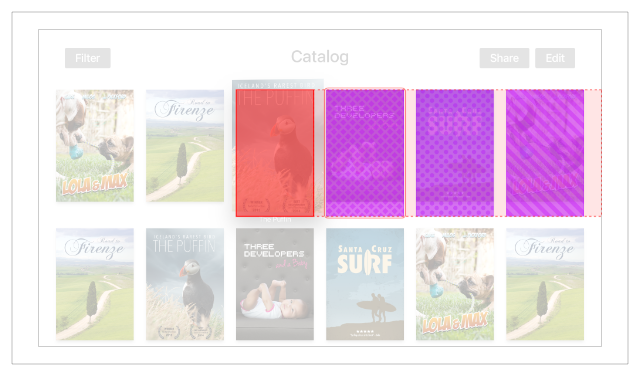 UITableView or UICollectionView reload their data. A new view controller is presented over the currently focused view. The user presses Menu on the remote to go back to the previous screen. The content of the app changes, so focus needs to change in order to stay where the user would expect. For example: A music app always needs the currently playing song to be focused. When a song ends, the app should request a focus update to move focus to the next song in the playlist. Upon performing an action, the user expects focus to move somewhere new. For example: An app consists of a split view with a menu on the left, and a collection of content on the right. As the user moves between menu items, the content on the right changes. When selecting a menu item, the user might expect focus to automatically move to the first item in the selected menu item collection on the right. A custom control, while it is focused, updates its internal state in a way that requires focus to change. For example, when a user clicks on the remote to select a picker control, focus moves into the control, letting the user pick from a set of options in the picker. Pressing Menu on the remote causes the control to be focused again. In this scenario, selecting the control requests a focus update to move focus into one of its subviews, through preferredFocusedView. If your app uses built-in UIKit controls, there is nothing your app needs to do to support focus out of the box: When the app launches, a focusable control onscreen is chosen as the initial focused view, and the focus engine takes care of managing focus for you for the lifetime of the app. However, for most apps you will want to implement custom focus behavior, such as updating app state when focus changes, implementing new types of interactive user interface elements, and performing custom focus animations. The following sections outline what you need to know to support custom focus behaviors in your app. UIFocusEnvironment controls focus-related behavior for a branch of the view hierarchy. 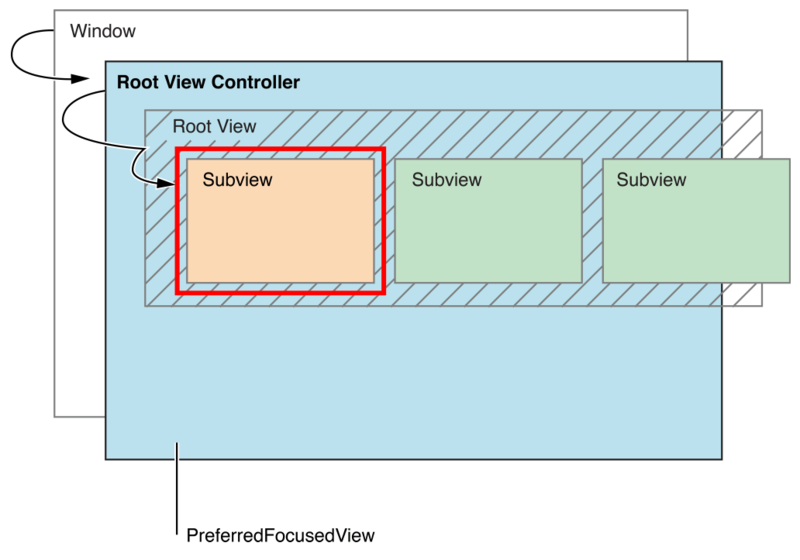 This means that UIViewController controls focus-related behavior for its root view and descendants, and UIView controls focus behavior for itself and its descendants. Thus multiple focus environments can control focus-related behavior for the same branch of the view hierarchy – views are contained in other views, but also in view controllers. Controlling focus-related behavior does not mean something is focused. It means that the focus environment can control how focus moves in its view hierarchy, and how the UI reacts to changes in focus in the environment's view hierarchy. Override the preferredFocusedView to specify where focus should start by default. Your view controllers can also request that the focus engine reset focus to the current preferredFocusedView by callingsetNeedsFocusUpdate. Note that calling setNeedsFocusUpdate only has an effect if the view controller contains the currently focused view. When you work with collection views and table views, you use a delegate object to define any custom behavior. This pattern is also used when implementing your focus-based interface. The UITableViewDelegate and UICollectionViewDelegate protocols declare methods and properties similar to those provided by the UIFocusEnvironment protocol, but for table view and collection view behavior. Use the collectionView:canFocusItemAtIndexPath: method with the UICollectionViewDelegate class or the tableView:canFocusRowAtIndexPath: method with the UITableViewDelegate class to specify whether a specific cell should be focusable. This action works similarly to overriding canBecomeFocused of UIView method in a custom view. Use the remembersLastFocusedIndexPath property, defined in both UICollectionView and UITableView, to specify whether focus should return to the last focused index path when focus leaves and then re-enters the collection view or table view. If your custom view needs to be focusable, override canBecomeFocused to return YEStrue (by default, it returns NO). Your view might always be focusable or only conditionally focusable. For example, UIButton objects are not focusable when disabled. Optionally override preferredFocusedView if focusing this view should redirect focus to another view (for example, a subview). When a focus update occurs, the current view is animated to a focused state, the previously focused view animates to an unfocused state, and the next focused view (the view that is focused after the update) animates to a focused state. However, unlike regular animations that your app defines, UIKit adapts the timing and curves of focus-related animations in order to achieve certain system-level behaviors. For example, when focus is moving quickly, the timing of the animations are sped up to keep up with the user’s movement. UIKit provides system-defined focus animations on the view classes that support focus. To create custom animations with system-defined behavior, use UIKit’s built-in class, UIFocusAnimationCoordinator, and the addCoordinatedAnimations:completion: method. Animations added to the coordinator are either run alongside the focusing animation or the unfocusing animation (not both), depending on the focus environment to which the coordinator is provided. 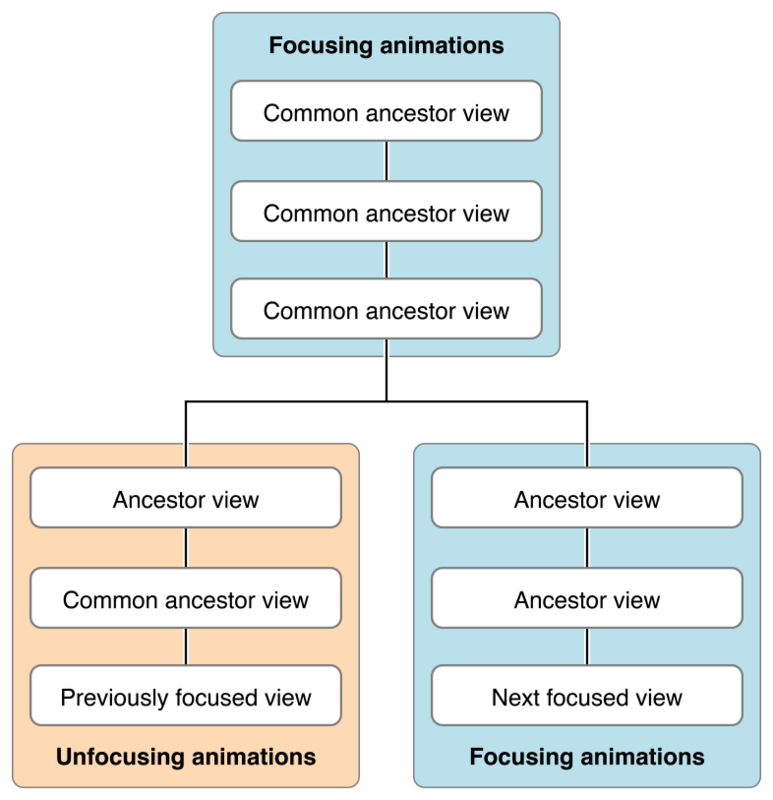 Common ancestors of both the unfocusing and focusing views, as well as exclusive ancestors of only the focusing view, will have their animations run alongside the focusing animation. Exclusive ancestors of only the unfocusing view will have their animations run alongside the unfocusing animation. Views commonly have different animations depending on whether they are becoming focused or losing focus. You can specify which view takes which kind of animation by overriding the view’s -didUpdateFocusInContext:withAnimationCoordinator:method and checking the context for the current focus state of the view. The following is an example of overriding the didUpdateFocusInContext:withAnimationCoordinator: method. Common ancestors of the unfocusing and focusing views can target animations for both the unfocusing view and the focusing view. For example, a UICollectionView can animate the previously focused cell and the next focused cell. The recommended approach in this case is to subclass UICollectionViewCell and implement the animation code in the subclass, using similar logic to the above code snippet. UIKit helps you debug focus issues while your app is running. Why Is This View Not Focusable? The view’s canBecomeFocused method returns NOfalse. The view’s hidden property has a value of YEStrue. The view’s alpha property has a value of 0. The view’s user interaction is disabled. The view is obscured by another view on top of it. UIKit provides a hidden method in the UIView class, _whyIsThisViewNotFocusable, to help test all previously mentioned common cases at once. This method is only meant to be invoked in the debugger on a specific view reference, and prints out a list of human-readable issues that could be causing the problem, as shown below. ISSUE: This view has userInteractionEnabled set to NO. Views must allow user interaction to be focusable. ISSUE: This view returns NO from -canBecomeFocused. Why Did Focus Move Somewhere You Did Not Expect? Sometimes focus doesn’t move where you would expect, or it might not move at all. The focus engine provides a lot of benefits, and sometimes you’d like to get more information about how it makes its decisions. UIKit sends a visual representation of how the focus engine searched for the next view to be focused in the Quick Look for UIFocusUpdateContext instances. To see this image, set a breakpoint in either shouldUpdateFocusInContext: or didUpdateFocusInContext:withAnimationCoordinator:. When the breakpoint is hit during execution of your app, select the context parameter in the debugger and open Quick Look. If the breakpoint was hit during a focus movement (not a programmatic focus update), then Quick Look presents an image to show the search path that the focus engine used to find the next focused view. Figure 3-5 shows an example.